The 2013 SRT Viper GTS Launch Edition evokes memories of past Viper Coupe reveals in 1996 and 2006 with symbolic GTS Blue paint and dual Bright White stripes – exclusive to Launch Edition models – running the length of its all-new exterior that incorporates iconic Viper styling cues with a contemporary execution. The 2013 SRT Viper GTS Launch Edition carries on the tradition of special Viper model builds to the fifth generation of the American-built supercar with true performance enthusiasts and collectors in mind. August 16, 2012 , Monterey, Calif. -	The Chrysler Group’s Street and Racing Technology (SRT) brand will mark their first official appearance at the renowned automotive events in Monterey, Calif., this weekend with the unveiling of the new, limited-edition 2013 SRT Viper GTS Launch Edition model. A sneak peak of the SRT flagship supercar will take place from 10 a.m. – 4 p.m Friday, Aug. 17, at the Quail Lodge as part of “The Quail: A Motorsports Gathering” event. Then on Saturday, Aug. 18, and Sunday, Aug. 19, the SRT Viper GTS Launch Edition will be displayed on the Concept Lawn at the Pebble Beach Concours d’Elegance. In addition to its historically significant paint scheme, the wheels on SRT Viper Launch Edition models are a modern deep-section design, featuring a five-spoke polished forged-aluminum design. 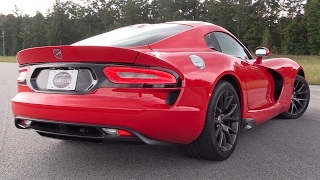 “Stryker” badges found on the hood and steering wheel add to the exclusivity, with a blue background replacing grey found on all other 2013 SRT Vipers models. Inside of the 2013 SRT Viper GTS Launch Edition, a serialized dash plaque further improves collectability by aligning the build sequence number to the vehicle identification number. Black Laguna leather with contrast stitching is found throughout, covering the seats, door trim, instrument panel, steering wheel, grab handle, shift knob and center console. Alcantara covers the headliner and white bezels are finished in Satin Silver. 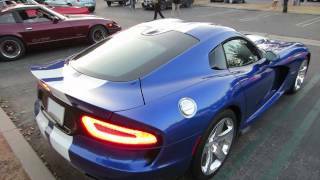 The 2013 SRT Viper and SRT Viper GTS models are set to return in fourth quarter of 2012 with more power and performance, superior craftsmanship, new technologies and creature comforts. An all-new carbon-fiber and aluminum skin is sculpted for high-speed stability and a slippery .364 drag coefficient. Chassis enhancements bring 50 percent improvement in torsional stiffness, while triple-digit weight reduction results in a Viper best power-to-weight ratio. The 2013 SRT Viper models feature timeless exterior designs incorporating iconic Viper styling cues with a contemporary execution. All-new, innovative interior designs set new standards with premium materials, new technologies and superior craftsmanship. In addition to showcasing the new 2013 SRT Viper GTS Launch Edition during the weekend, the SRT brand will have an expanded new vehicle display at the Quail Lodge on Friday, Aug. 17, along with additional displays and interactive fan activities at the Rolex Monterey Motorsports Reunion at Laguna Seca Raceway from Aug. 17–19 and the Pebble Beach Concours d’Elegance from Aug. 16-19.